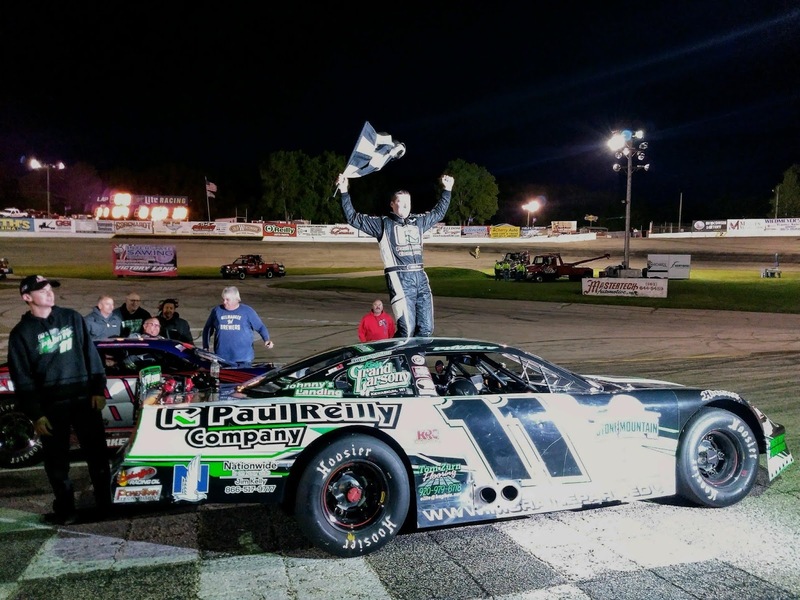 Alex Prunty Racing: ALEX PRUNTY EDGES BRAD MUELLER IN A PHOTO FINISH AT SLINGER! 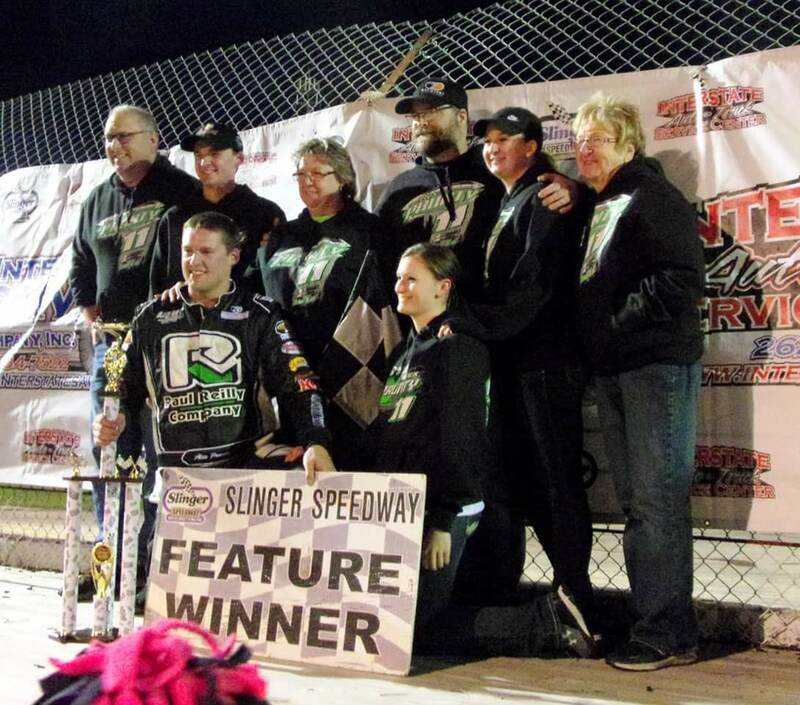 ALEX PRUNTY EDGES BRAD MUELLER IN A PHOTO FINISH AT SLINGER! Slinger, Wis., June 3— Alex Prunty survived a clean hard fought battle with Steve Apel and then turned back a hard charging Brad Mueller to win the 60-lap First Round of the Triple Challenge super late model feature in a photo finish Sunday night at the Slinger Super Speedway. Alex Prunty and Rob Braun led the field to the green flag and Prunty drove to the early lead as Steve Apel tucked into second place while Braun battled with Gary LaMonte and Chris Blawat behind the top two. LaMonte and Blawat moved into third and fourth respectively just before the first caution flag waved on lap ten when Brad Keith’s car began leaking fluid on the track. Alex Prunty and Steve Apel continued their battle for the top spot as racing resumed with Apel making numerous attempts to pass on the inside while right behind them LaMonte and Blawat had their own side by side battle for third. Brad Mueller, Ryan DeStefano, Nick Wagner, and Dennis Prunty all raced in tight formation behind the top four. As the race approached halfway, Dennis Prunty and Mueller broke free from their pack and caught the top four while Apel continued to make several attempts to take the lead from Prunty. With Alex Prunty and Apel staging their battle for the top spot, the battle over fourth became heated on lap 28 when Blawat and Dennis Prunty made contact off turn two with Prunty’s car momentarily launching on top of Blawat’s machine to draw the caution flag. Both cars left the track for repairs but were able to continue in the race as Alex Prunty and Apel lined up for the restart. As racing resumed, Alex Prunty and Apel once again went door to door for the lead as LaMonte looked on from third while Brad Mueller had the outside working and he quickly the joined the top three. Mueller was able to use the outer groove to take over third from LaMonte and began to track down the top two who continued to race side by side. Apel held the low groove and was able to inch ahead slightly but Prunty powered off the turns on the high side and was able to maintain the lead all while Mueller sat directly on Prunty’s bumper in third place. With five laps to go, Apel’s car began to show signs of smoke and he dropped to the inside leaving Mueller to step up and battle Prunty for the lead. Mueller pulled alongside Prunty as the two raced to the white flag and they continued in that formation on the final lap with Mueller holding the inside and Prunty working the high groove. Mueller edged ahead slightly off turn four but Prunty powered off the final turn on the high side and won the drag race to the checkered flag by just .025 seconds. Ryan DeStefano capped off a very strong run with a third place finish while Gary LaMonte and Nick Wagner rounded out the top five. Jon DeAngelis finished sixth while Grant Griesbach was seventh. Dennis Prunty rebounded from his earlier incident to finish eighth while Tim Lampman and Rob Braun rounded out the top ten finishers. 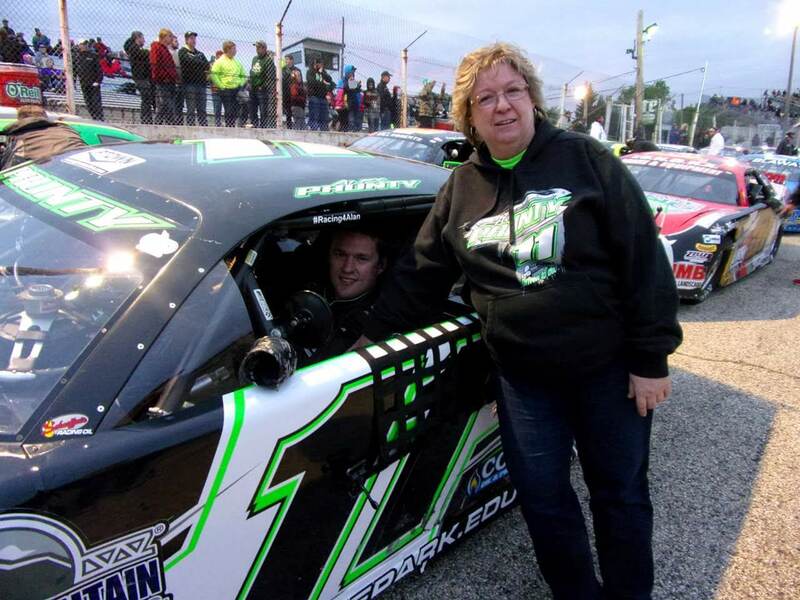 Mike Egan won the 20-lap super late model semi-feature over Mike Held and Jordan DeVoy.. Jake Vanoskey finished fourth and Jerry Eckhardt was fifth. Super late model heat races were won by Jake Vanoskey, Alex Prunty, and Ryan DeStefano while Brad Mueller was the fastest qualifier after circling the speedway in 11.241 seconds.